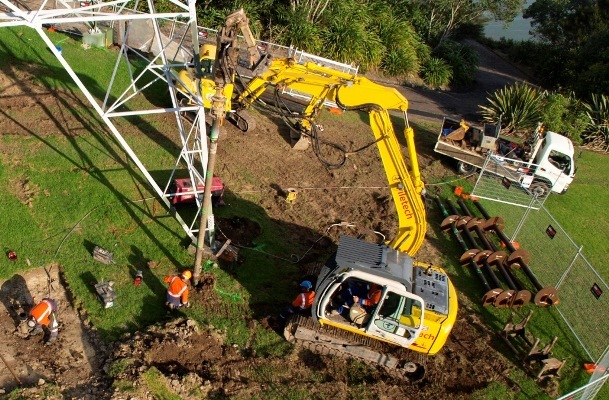 The earthquake strengthening of New Zealand’s buildings and infrastructure is an on-going process, and Transpower’s transmission pylons linking Northland to the national grid are no exception. 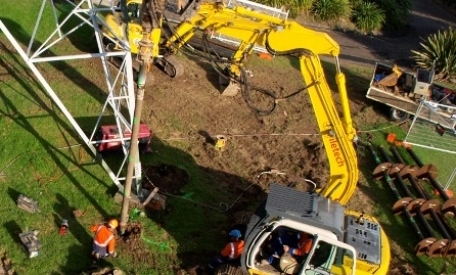 New corbels were required on a number of towers and Piletech was contracted to screw pile six of the transmission towers on the Henderson to Otahuhu ‘A’ line, with between four and eight piles per tower. The project required robust quality and Health & Safety compliance, due to working in close proximity to high voltage lines as well as the general public. Piletech’s experienced crew achieved this without incident, while working in challenging site conditions across multiple work faces, including commercial properties, public parks and roadside settings.